The Boston Early Music Festival’s concert series continued on Saturday night at First Church, Cambridge (Congregational) with the Boston debut of the London Haydn Quartet, joined by clarinetist Eric Hoeprich [mentioned on these pages many times, especially here] for masterworks of Haydn, Beethoven, and Mozart, played with dazzling style and verve. Some suggest that we have entered a golden age of string quartet playing. 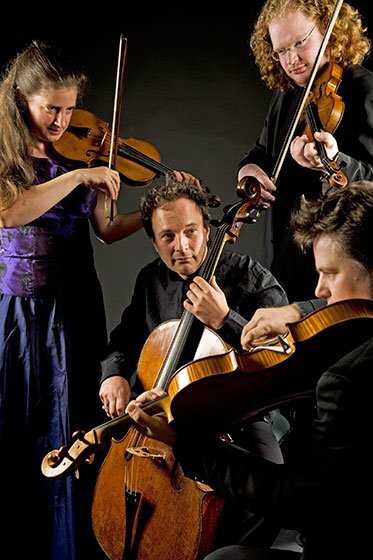 The London Haydn Quartet’s micro-controlled intonation, their attention to details in the score, and their flexible approach to tempo and phrasing place them at the vanguard of this age. The Quartet formed at the turn of the millennium out of a passion for Haydn’s string quartets, so it comes as little surprise that they opened with Papa Haydn’s String Quartet in B-flat Major, Op. 50, No. 1. They play on gut-strung instruments with Classical bows, which makes for a sound which decays much faster, and with a straighter, lower-vibrato tone than modern string instruments. This Haydn quartet showed the things this group does wonderfully. Group intonation was impeccable, with gorgeously tuned chords and pungent dissonances. They exploited the rapid decay of their string sound to make organic phrasing. Sustained notes moved with shape and direction, repeated phrases were subtly varied and inflected, and the entire group picked up and slowed down the tempo without ever falling out of step with each other. The theme-and-variations slow movement gave each individual player a chance to shine with impressively clean, fast passagework solos. And throughout, they showed off the kind of deft comic timing that is essential in Haydn, using space and silence deftly to bring out Haydn’s deceptive cadences and surprise changes of direction. The players were lots of fun to see for the ways they watched and listened for each other. Violist James Boyd was especially animated, rocking, bopping, and grinning with delight at nifty turns of phrase pulled off by his colleagues. First violinist Catherine Manson sailed through her challenging leaps and runs, kept a firm grasp on the ensemble tone with abrupt changes of glance and gesture, but deferred and supported beautifully when another player had the main tune. Second violinist Michael Gurevich formed a burbling, driving rhythm section with violist Boyd, but could play the lead violin part with his own distinctive phrasing. And cellist Pierre Doumenge provided a solid rhythmic and harmonic foundation, fitting in beautifully even though he may not be their regular cellist (the group’s web site lists Richard Lester as their cellist, while their Facebook page names Jonathan Manson). Beethoven’s String Quartet in D, Op. 18, No. 3 was probably the first quartet that he completed, and has stylistic parallels to Haydn. The London Haydn Quartet played up the differences, deploying a bigger sound for Beethoven’s starker contrasts of register and dynamics. The highest, fastest, loudest material for the first violin in the first movement show the challenges of keeping gut strings in tune. But the small flubs of intonation reminded us that these players are human after all, and drove home the astonishing precision of all the rest of the playing. The group made thoughtful sense out of Beethoven’s quirky changes of mood and pace, again dragging out space and silence in the end of the first movement beautifully, exchanging motifs and musical ideas seamlessly in the slow movement, marking the transition to the third movement’s Scherzo reprise with droll, dry pizzicato playing, and playing the coda of the final movement with furious abandon, abruptly pulling back to end with the whimper Beethoven calls for, without a note out of place. After the intermission, the group was joined by clarinetist Eric Hoeprich for Mozart’s Quintet for Clarinet and Strings in A, K. 581. 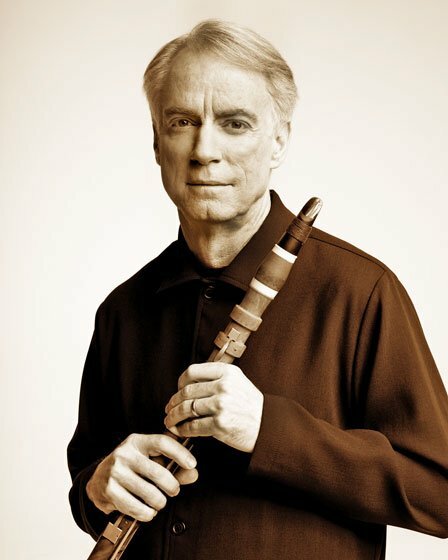 Hoeprich played a basset clarinet, a speculative reconstruction of the instrument used by the Quintet’s dedicatee, Anton Stadler. Engravings depicting the instrument [copy here] at show a distinctive shape, and its range stretched a third lower than a regular clarinet. Hoeprich’s instrument had a mellower sound than a conventional clarinet, and it worked beautifully with the gut strings. Where the clarinet solos over the strings, Hoeprich delivered a robust, beautifully phrased and shaped tone. He repeated phrases with elegant ornaments and altered inflections, and sounded low notes with clarity and authority. Where the clarinet ducks into the ensemble, he could blend in with the string tone gorgeously, resulting in eerily beautiful chord textures in the beginning of the second, slow movement. In the third movement Menuetto, the second trio lilted with the country-dance feel of an Austrian Ländler, and Hoeprich yodeled his clarinet part above and below the string texture. And in the final movement, they used Mozart’s theme-and-variations structure to play up all manner of nice solo, duet, and trio work, backing into the pregnant-pause cadences to build up anticipation, then taking off at the end in a brilliant unison fusillade. Their playing rose above the challenges of the concert space. First Church in Cambridge has a gorgeous interior and resonant acoustic which works well for unaccompanied choral music. The London Haydn Quartet’s painstaking, finely honed details got lost in the church’s echoing wash of sound. And the church’s heating system sounds a faint but persistent B-flat, which is acceptable in a Haydn quartet in B-flat major, but soured the harmonies in the sharp-key Beethoven and Mozart works. A group like this might sound better in acoustically drier spaces like the Mosesian Theater in Watertown or Calderwood Hall at the Isabella Stewart Gardner Museum. calderwood at izzie’s only if you’re on the first floor; better would be jordan hall, which would wrap their sound around the audience. An addendum: I can confirm that Pierre Dommergue is a guest cellist who has joined the London Haydn Quartet for this current tour. Richard Lester is the current regular cellist, and the Facebook page personnel listing is apparently out of date. Which makes the quality of the ensemble playing all the more impressive, considering he doesn’t have the benefit of having played for years with the others. And it does leave you wondering about how tremendous a London Haydn Quartet performance of the Schubert String Quintet could be, with Dommergue at the second cello.